Karie Reinertson giggles as she describes the first piece of clothing she made by hand when she was 15—a shiny teal skirt affixed with glittery plastic star beads. From there, she and a friend moved on to making even louder skirts with feather boas and ribbons sewn around the hems. Looking at her current line of handsome, sturdy bags and backpacks made with waxed canvas, leather, and geometric-patterned fabrics, it’s difficult to image that glam teenage start. But there have been many steps along the way to creating Shelter Protects You, the umbrella name that pulls together her creative endeavors with those of her architect partner, Rob Maddox, who also happens to have a talent for leatherwork. Although she experienced early success selling clothes to stores in Washington D.C. and along the West Coast during college, the competitiveness of the fashion world didn’t feel like the right fit. “It seemed like a different world than the one I wanted to live in,” she says. Reinertson studied painting instead, and earned her degree in fine art from Corcoran College of Art & Design in D.C.; then worked in arts administration before changing her focus to study environmental education. It was while interning at Yestermorrow Design/Build school in Warren, Vermont, that foraging excursions in the surrounding forest inspired a new direction. She fashioned a handy berry picking bag which hung around the neck and featured a bent wood frame to keep the bag open. Since, she and Rob weren’t the only folks harvesting blueberries from the hundreds of bushes near the school, she soon found herself making bags for friends and selling to local stores. 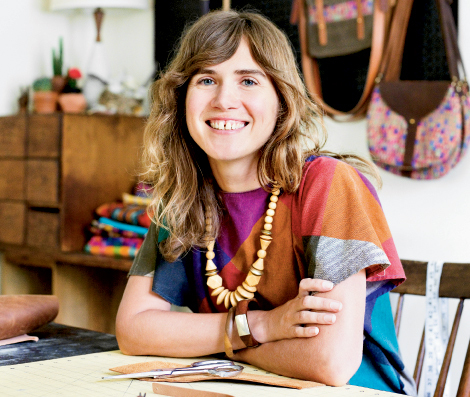 She also came up with a mushroom collecting pack that led to the design of The Prickley Mountain Bag, an attaché with leather straps and a bright geometric-print fabric. In the fall of 2010, Rob accepted a job with Virant Architecture in Asheville. After the move, Karie continued to sell her bags through shops when a friend convinced her to try indie craft site Etsy. At first, she was hesitant. “I liked word-of-mouth and meeting the people that I sell to, so selling online was kind of foreign to me,” she explains. It took two months to get her first online order and then the sales began building quickly. “People started buying a lot and it started to get out of hand,” she remembers. In early 2011, she recognized it was time to get serious; the business needed to be more than a side project. She began expanding the line to include durable fabric and leather pouches, purses, wallets, belts, and backpacks, bearing names such as The Taplin Bag and The Plunskton Pack. She sources all the materials with an eye toward sustainability and fair trade working conditions. “I’ve found a North American hide source, so I can know the tanneries are treating their employees ethically.” In addition to the Shelter Protects You website and Etsy, her wares are available at The Dry Goods Shop in West Asheville and in boutiques throughout the states and internationally. Even as the business has blossomed (she estimates she’s made 700 bags in a year and a half) she and Rob still handle most of the production, believing there’s a different sense of responsibility and attention to quality when you complete the work yourself. Still, when the orders are just too much for two people to handle, she puts her trust in Opportunity Threads, a worker-owned cut-and-sew cooperative in Morganton.